EVERY DAY we hear of heart-wrenching stories of divorced or separated women whose rights have been blatantly denied. Perhaps the most regretful is the tendency of former husbands to deny a woman’s natural right to see her children. Alya Al-Ghamdi, who has allowed her real identity to be published, is one of those mothers with a deeply disturbing story. Previously married to a Saudi, Alya was divorced after a few years with three children. Subsequently she married a British Muslim working in the Kingdom. Her woes started when her former husband denied her the right to see her children for a whole year on the pretext that her British husband will molest her daughters, although Islamic Shariah law accords the status of Mahram (male legal guardian) to a step-father over his wife’s daughters born in a previous marriage. To stop Alya from meeting her children, he included conditions that her present husband should not be present when she met the children. He also changed his telephone number so that she would not be able to contact the children. When she tried to meet her daughters at their school, the school principal threatened her that she would call the police as their father did not want the mother to have any contact with them. The desperate mother’s next attempt was to meet the children on the sly at their father’s house when the man went out. But once the ex-husband discovered that, he changed the entry door lock to prevent the children from letting their mother in while he was away. As a last resort, Alya would wait hidden nearby until he left the house. She would then throw small stones at the first floor apartment windows. Her six-year old son would open the window and thrust out his body saying that he would eat plenty of food so that he will grow up fast and be with his mother. This ordeal continued for three more years until her oldest daughter was 14. It was this daughter who cooked for and looked after the other two while their father was away. Later the mother was finally allowed to meet the children but only the daughters. She noticed that the eldest girl had cut off her long hair. When Alya asked her to let her hair grow like other women, the girl’s reply was that she had shortened her hair like boys because a woman had no public existence. Following the death of her father and with meetings with her children becoming more difficult and rare, Alya left the Kingdom with her husband engulfed by the dream to see her children whenever she wanted and without any restrictions. The former husband’s justification for his denial of her rights was that she is not eligible to meet the children. But what eligibility is weightier than a mother’s unrestricted right to see her children? 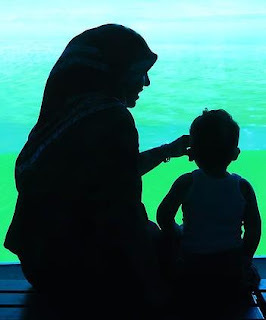 The primary right of a mother to her children is unequivocally affirmed by a well-known statement of the Prophet (peace be upon him) that “paradise lies under the feet of the mother”. I pray to the Almighty to return Alya’s children to her just as He returned Moses (peace be upon him) to his mother. I also request the Minister of Justice to grant Alya the right to see all her children in the company of her present husband who is her and all her children’s Mahram, whenever she feels to see them or whenever they yearn for their mother’s embrace.